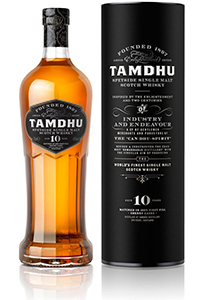 May 4, 2013 – Tamdhu Distillery made its re-appearance on the whisky stage today during the Spirit of Speyside Festival with the release of its first single malts since the distillery was purchased out of mothballs by Ian Macleod Distillers nearly two years ago. During a rare open day at Tamdhu, the new Tamdhu 10-year-old was released along with a special limited edition version. The 10 Year Old was matured in Sherry casks and is bottled at 40% ABV, while the 10 Year Old Limited Edition (1,000 bottles) was matured exclusively in first-fill Sherry casks. The basic version retails for £34.99 ($54.50 USD), while the Limited Edition will sell for £100 ($155.75 USD). Both are available through the Tamdhu web site and whisky specialist retailers in the UK. For a perspective on Tamdhu’s revival, listen to Episode 323 of WhiskyCast from July 3, 2011 and Mark Gillespie’s interview with Ian Macleod managing director Leonard Russell.